It was one of the first classes led by the Art with a Heart founder and executive director. Now, 16 years later, she has established a wide-reaching organization that teaches 10,000 classes a year, has installed mosaics and murals across Baltimore, offers job training programs and operates a social enterprise art retail store. She can still remember that day, her first at that group home. She called her husband from the car after the class to say that she barely got through the project. “A person lesser than me would have never walked back in that place again, but I was so determined to create a connection with the kids,” Pupkin said to him. And so she did, taking them to New York City twice and leading programs at the home for years. When one of the boys was aging out of the group home, Pupkin welcomed him into hers and informally adopted him. Isiah Bullock has now joined their family, along with their son and daughter. He served in the U.S. Marines and is attending Stevenson University. Pupkin was working as a practicing attorney in commercial litigation when she had yet another adversarial phone call with opposing counsel. She wanted a change, and started the organization on a shoestring budget on the evenings and weekends. She was a creative thinker who had always enjoyed art classes. She decided to bring those classes to underserved people, starting at two group homes — a shelter from domestic violence for women and children and an Alzheimer’s facility. It was, she hoped, her first step to doing something productive and meaningful – something she had always dreamed about as a child of the Civil Rights era. Art with a Heart began in March 2000 while Pupkin was still practicing law. It now has eight full-time employees, a headquarters and the store Heartwares next to it in Hampden. Art is essential to the soul, Pupkin said. She believes that the ability to think creatively is necessary for success. “If you don’t have access to opportunity for creativity, you can be the best engineer in the world but I think it will be challenging to solve problems,” she said. Art with a Heart reaches people by providing consistent, structured nurturing presence from adults, and by allowing them to tap into their creative side. The job-training program works with youth over a longer period of time, so Pupkin can see the impact it makes. Some of the youngster that trainers work with come from unfortunate circumstances like dropping out of high school or aging out the foster care or group home system with nowhere to live. “We watch them walk in the door kind of cynical and we see them six weeks later committed, enthusiastic, excited about their future,” she said. Art with a Heart is perhaps most visible through the way it has transformed public spaces in the Baltimore area. 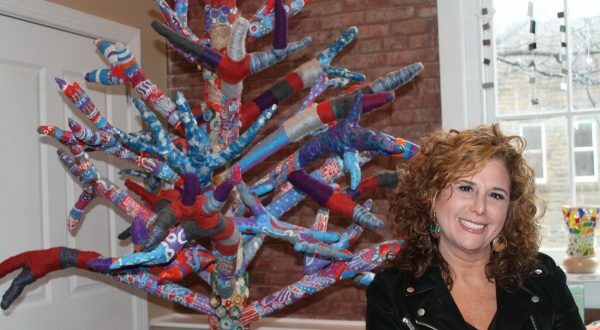 About 5,000 volunteers annually have helped create 45 art installments. At Restoration Gardens, a supportive permanent housing facility for homeless youth, for example, 250 volunteers completed an 18-foot-by-10-foot mosaic mural. And the projects are continuing. To help celebrate the 200th anniversary of BGE this year, Art with a Heart is creating 100 smaller mosaics that will be installed at schools within the BGE service area. The newest initiative of the organization is the Art of Leadership, a leadership program where 10th and 11th graders are brought together to create a public art piece and spend 15 months learning about the issues facing Baltimore. Pupkin did not build Art with a Heart alone. She said that is a crucial ingredient for other women leaders. “I started this organization but certainly it wouldn’t be there if I didn’t have the support both professionally and personally to help make it successful,” Pupkin said.